Today’s card took me less than 5 mins to make from start to finish! 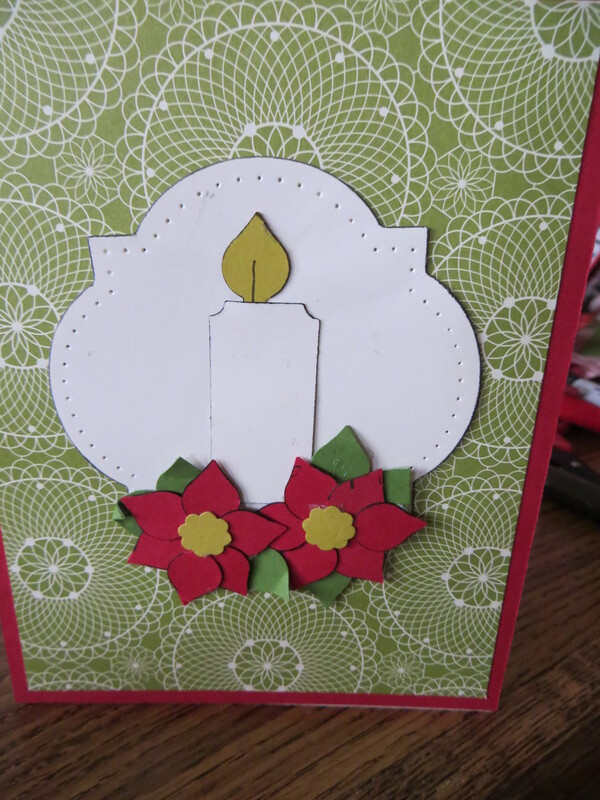 I like to create a simple and quick card but love it when it turns out cute too. 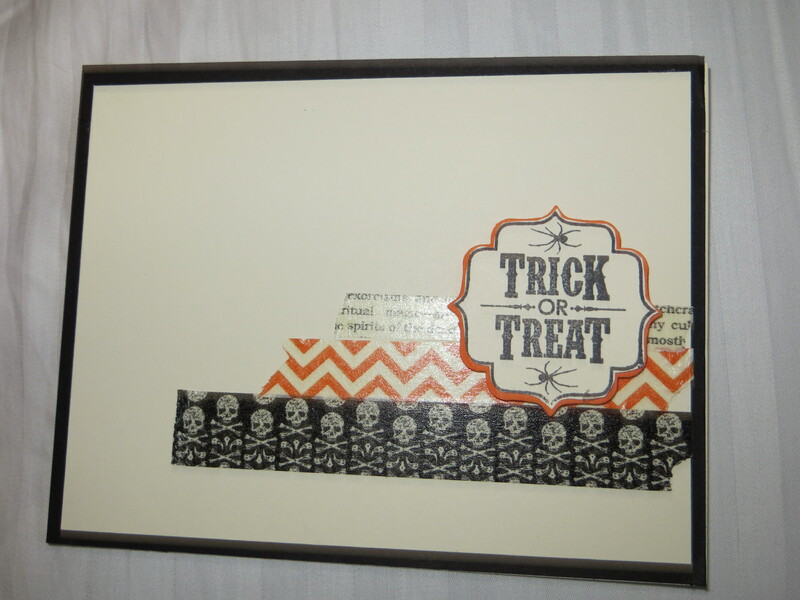 I used the Witches Brew Washi Tape #132156 to add to the background and then topped it off with a punched sentiment from the Tags 4 You #131820 stamp set and the coordinating Label Bracket Punch #132153. 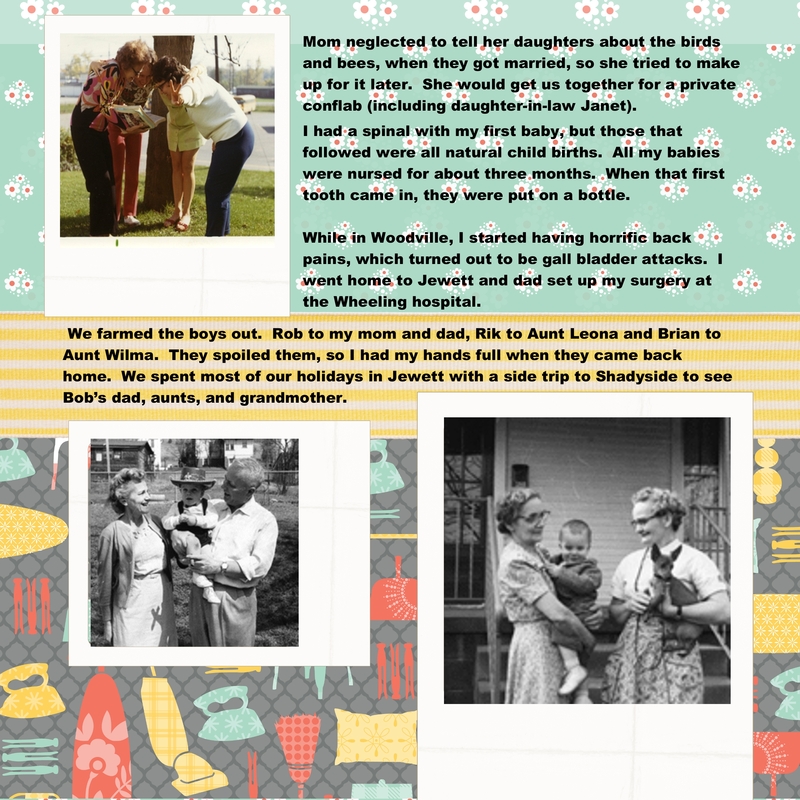 All these items are available from the Stampin Up Holiday catalog. Please note: the Tags 4 You stamp set and the Label Bracket punch are a bundle and save item. When purchased together, (wood #133293 & clear #133294) you save 15% off. The items in the holiday catalog are available for a limited time- 2 January 2014. 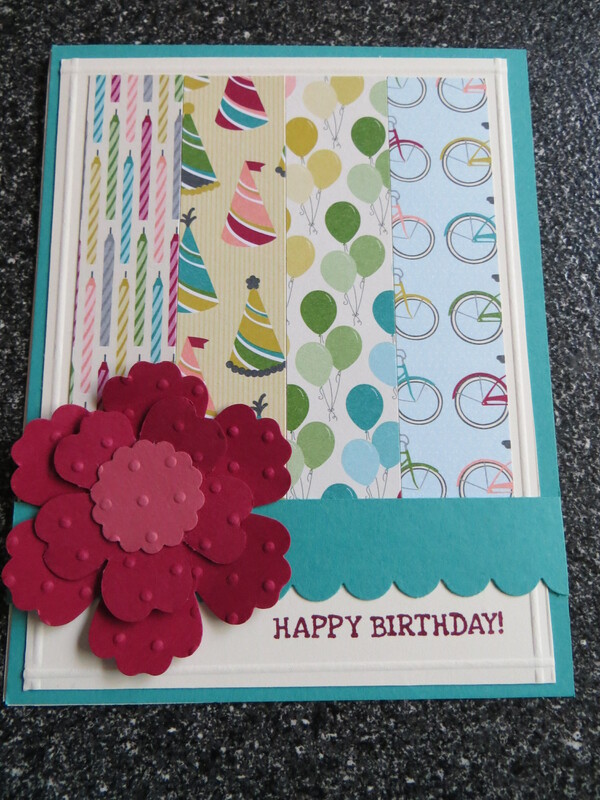 Nothing screams birthday like the bright and fun colors in the Stampin Up Birthday Basics DSP. I love the fun patterns in the birthday paper but used caution to not over do it; so I used strips of the patterned paper and added a textured layered fun flower using the Blossom punch #125603, the Pansy Punch #130698 and the 7/8″ Scallop circle punch #129404 for the center. I layed the flower along the contrasting Scallop edge border #119882. Super easy and a great way to use up scraps. 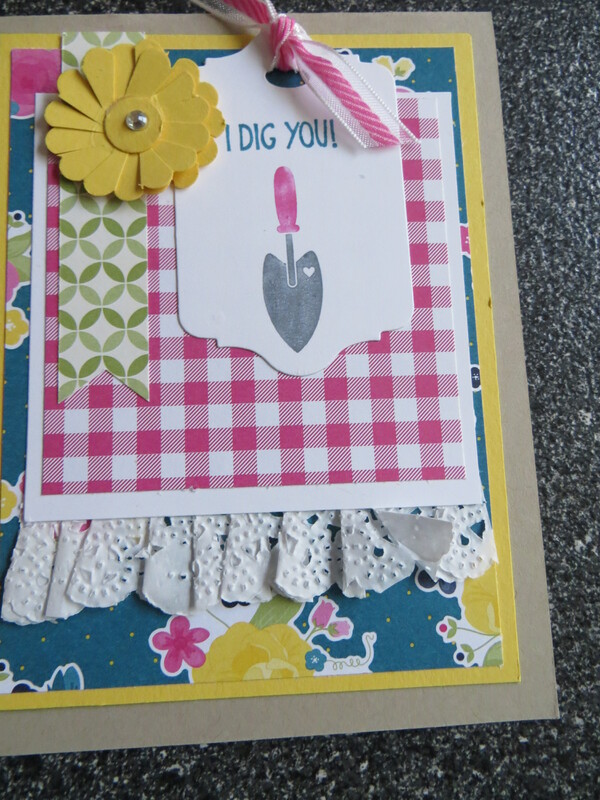 I used the Gingham Garden DSP #129310 from the Stampin Up annual catalog to create this countryside garden card. I used the Chalk Talk framelit #129983 to make the tag that I stamped the shovel image from the Tag It #130303 stampset. The Tag It stamp set is the charitable stampset that supports the Ronald McDonald House Charities. For every Tag It set sold Stampin Up donates $3 to RMHC- to date Stampin Up has donated over $1,000,000 to RMHC. To complete the card I added paper ruffle using the edge of the Tea Lace Paper Doilies #129399 and made a sunflower from the 1 3/4 ” scallop circle punch #119854. For today’s card Cammie drew her inspiration from the card on page 37 of the 2013-2014 Stampin Up annual catalog. She stepped it up by using used the all new Stampin Up Thinlits Circle card die#133480 that cuts, scores and creates a card that flips in just 1 easy step. 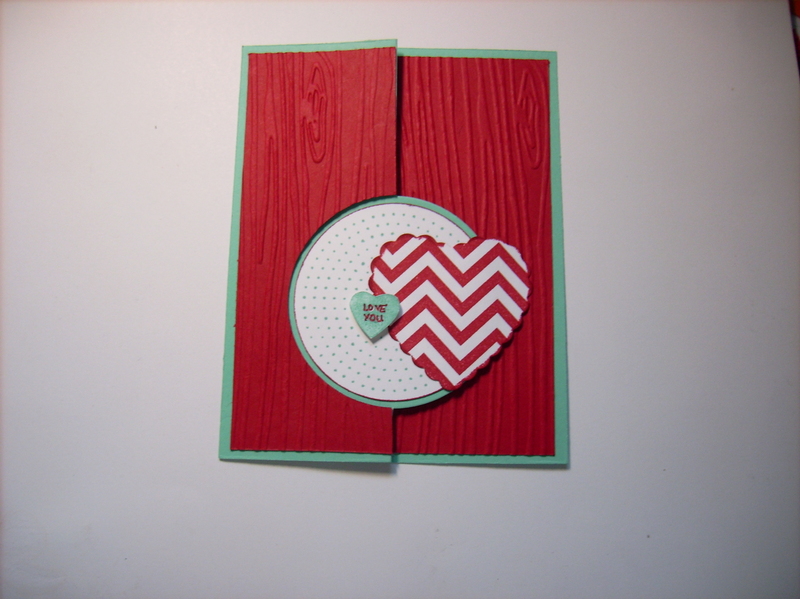 The real red cardstock was textured with the woodgrain textured folder #127821. The flappable circle has a heart cut from scrap DSP using the Hearts a Flutter fra,elits #130159 on the front side and the flip side has the Yippee-Skippee #131344 stampset stamped multiple times. She finished the seam with hearts punched using the small heart #117193. Super fun and cute card. There is also a thinlit label diecut card 133479 that is equally as cute. 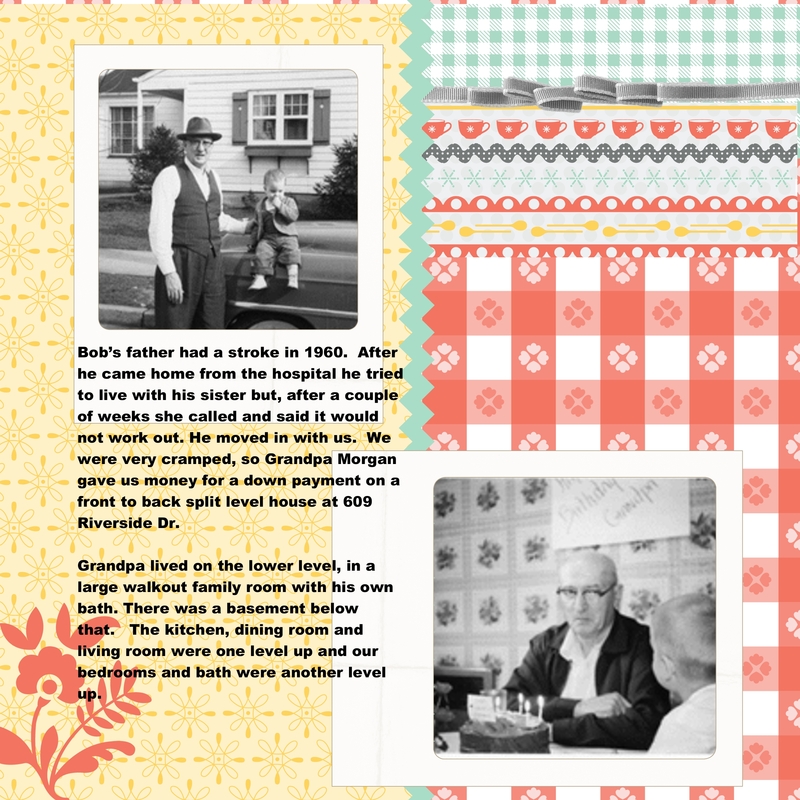 Cammie supplies a couple of local shops with her cute cards. One of the demands is to have baby cards available. Baby cards are tough to make but once Cammie purchased the Baby Prints #125472 stamp set from Stampin Up she was able to keep up with the baby demands. The background is whisper white cardstock is textured with the Alphabet Press #130816 and the crushed curry cardstock is textured with the Square Lattice #119976 folders from the current Stampin Up catalog. Cammie stamped the hand and foot prints and then fussy cut them out before adding them to the card front. She finished the card with the cute sentiment cut into a custom banner. Today is the 25th and that means time for a Christmas card posting. Can’t believe it is just 3 months from Christmas and I already have some of my this year’s cards done! Sorry for the horrible picture for today’s card but I wanted to focus on the main punch art piece. 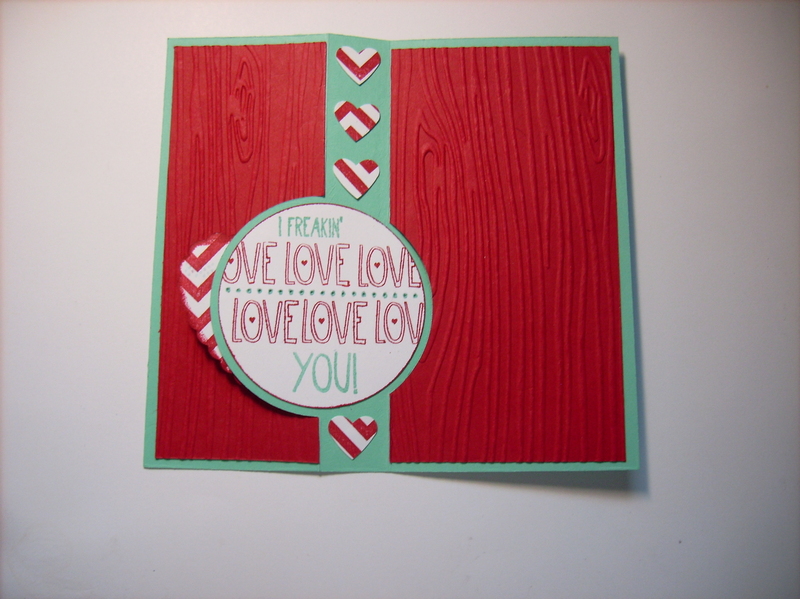 The background DSP is from a now retired Christmas line from last year’s Stampin Up catalog. The poinsettias were created using the mini Christmas punches (no longer available), the candle is made from the Ticket Duo Builder punch #126883 and the flame is the mini ornament punch (no longer available. The candle is mounted on a window frames collection framelit #129021 and pierced using the coordinating Festive paper piercing pack #127857. I truly love creating punch art.